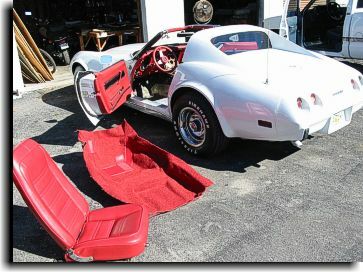 1) Form fitted carpeting - This type of carpet has a hard plastic back that is put into a form and then molded to fit the flooring configuration of a particular type car. This is the type of carpet that is used for an OEM replacement. 2) Cut and sewn carpeting - This type of carpeting has a soft rubber backing. This carpet is used when an upholstery shop will Tailor fit the carpet to the automobile. This carpet is purchase as roll goods by the yard. Sewing is required for this application to achive a fit for the flooring configuration and (deep) seams will be seen where the fit is achieved. 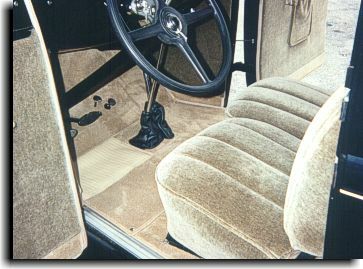 This carpet is used for automobiles that does not have a form fitted replacement available, needs custom fitting for the the odd job and older original type carpeting that needs the carpet to fit as required with special tailoring - example: cutting the carpet to within a 1/4" tolerance so the sewn binded edge will lay properly next to a seat edge, rear door panel, kick panel, ect. This type of carpeting also has more jute carpet padding installed (as compared to a form fitted carpet) and is locked into the floor with more gluing. 3) Non- backed stretch carpeting - This type of carpeting does not have a backing milled onto it and when installing this carpet, it can be "stretched" into the places that a carpet with a backing on it cannot. Most of the time, this carpet is glued right over the existing carpet. This type of carpeting is a cheaper brand of carpet and will not last as long as a backed carpet. This is the carpet that is used a lot of times by used car resellers. With it's cheaper price and ease of installation, upholstery shops do not have to charge as much as a form fitted or a cut and sew carpet installation. Unfortunately, when upholstery shops give a cheap price on carpet installation to the retail consumer, this is the kind of carpet that is used. This cut and sew carpet had to be tailored to fit so binded edges would lay properly next to the kick panels and door edges. Also, boots had to be made for shifter and emergency brake controls. New Xtreme Colors For Any Form Fitted and Cut and Sew Custom Carpet Installations!!! Form fitted carpet and carpet by the yard is available for purchase for the do-it your selfer. Note: Color shades may be different from actual samples due to montior variations.